1. Convenient and stylish paper organizer fits regular, double, large, mega, jumbo roll, won't fit the oversized one. 2. Enduring, peaceful style brings a casual and graceful appeal to your remodeled room, never out of date and reliable. 3. 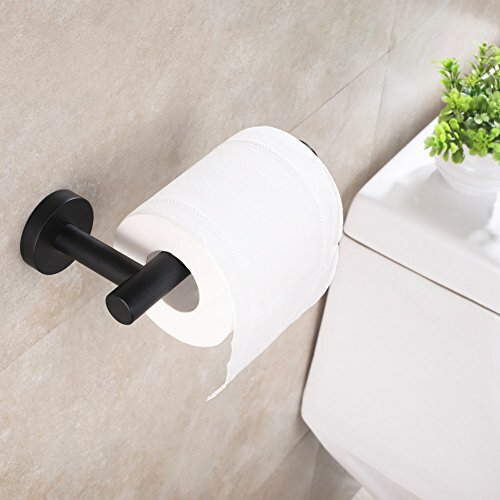 Cylindrical contemporary design gives option of mounting direction according to your using environment. 1. ONLY clean with a soft, damp cloth gently. as they may harm the protective finish of your bath accessories. 3. Maintenance period is 1-2 months, this care will maintain the metallic gloss finish. 1.NOTE: All photography props are NOT included in the package. 2.Manual measure may occurs a little dimension deviation, please in kind prevail. 3.Due to light influence and display resolution, pictures and objects may have slightly color aberration. APLusee Home Life is a professional manufacturer that is concerned with the design, development and production of Kitchen & Bathroom Accessories, Kitchen & Bath Faucets and Sanitary Hardwares more than 20 years. Our products are natural and simplistic in nature. Combining talents and creativity, we offer you unique styles and humanized designs, helping you maximumly extend your bathroom & kitchen storage. Just enjoy your time with us. ECO-FRIENDLY & SMART COLOR, high-grade matte black paint, no fade, stain-proof, offers the best solution to solving fingerprints, the accumulation of dust and oil. 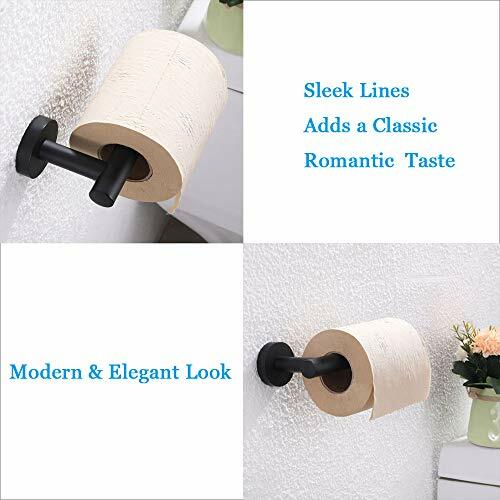 Elegance, modern style in your bathroom, bedroom, toilet and kitchen, adds great beauty and reduces annoying cleaning. 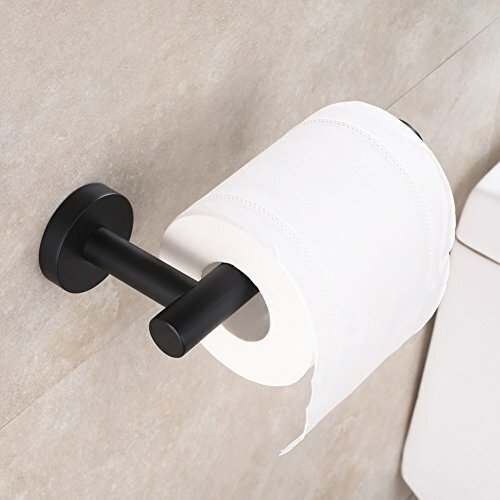 SMOOTH & FUNCTIONAL APPEARANCE, sleek cylindric look collocates with practical open arm design, allows replacing and tearing a roll of paper easily and fluently. Coordinate well with a wide range of contemporary bathroom renovation. Net weight: 0.38 lb (173g). 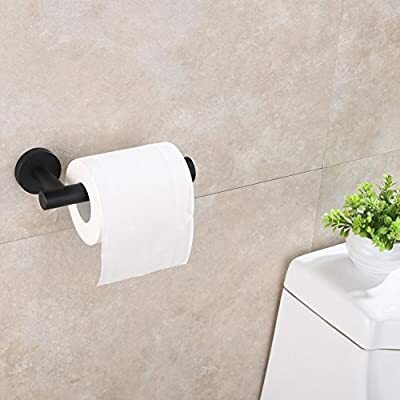 MULTIPURPOSE HANGER, utility bath tissue holder has appropriate size for daily paper roll, can also be used as hand towel, dish towel holder. 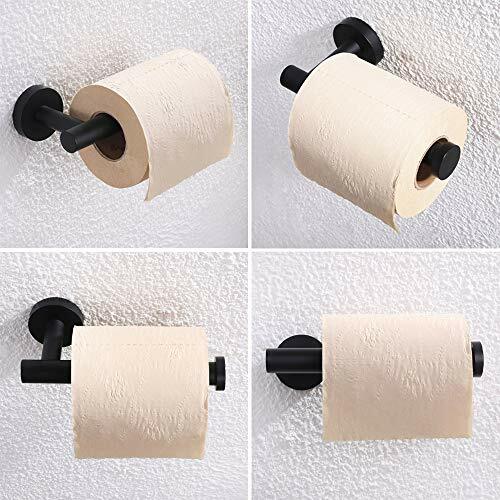 A good space-saver to organizes your bathroom fixtures. Overall size: L 6-1/2" x D 3-1/8" x H 1-7/8"(165 x 80 x 47mm). 3 DIRECTION & SAFE HOLDER, one arm style doesn't limited Installation direction, can choose mounting it left, right or vertically. Tail end has lager round hook prevents paper roller from dropping off, can security hangs in different place. SIMPLE INSTALLATION, complete mounting hardware included for easy to install. Hardware is hiding after attaching firmly, provides a neat look to our paper holder, keeps your wall environment clean and nice.